This book argues that the concept of care is a political and a moral concept. As such, it enables us to examine moral and political life through a radically different lens. The editors and contributors to the book argue that care has the potential to interrogate relationships of power and to be a tool for radical political analysis for an emerging critical social work that is concerned with human rights and social justice. 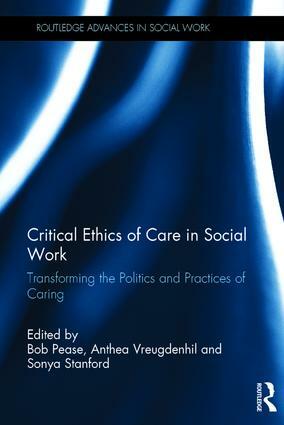 The book brings a critical ethics of care into the realm of theory and practice in social work. Informed by critical theory, feminism, intersectionality and post-colonialism, the book interrogates the concept of care in a wide range of social work settings. It examines care in the context of social neglect, interdisciplinary perspectives, the responsibilisation agenda in social work and the ongoing debate about care and justice. It situates care in the settings of mental health, homelessness, elder care, child protection, asylum seekers and humanitarian aid. It further demonstrates what can be learnt about care from the post-colonial margins, Aboriginal societies, LGBTI communities and disability politics. It demonstrates ways of transforming the politics and practices of care through the work of feminist mothers, caring practices by men, meditations on love, rethinking self-care, extending care to the natural environment and the principles informing cross-species care. The book will be invaluable to social workers, human service practitioners and managers who are involved in the practice of delivering care, and it will assist them to challenge the punitive and hurtful strategies of neoliberal rationalisation. The critical theoretical focus of the book has significance beyond social work, including nursing, psychology, medicine, allied health and criminal justice. Bob Pease is Honorary Professor in the School of Humanities and Social Science at Deakin University and Adjunct Professor in the Institute for the Study of Social Change at the University of Tasmania. He has published extensively on masculinity politics and critical social work practice, including four books as single author and 12 books as co-editor, as well as numerous book chapters and journal articles. Anthea Vreugdenhil is Senior Lecturer in Social Work at the University of Tasmania and a Churchill Fellow. Her research program is broadly situated in the area of care, with a focus on aged care and the changing nature of care in social work and society. Anthea has a track record of high-impact publications, underpinned by a strong policy and practice focus. Sonya Stanford is Head of Social Work at the University of Tasmania. Her research ‘speaks back’ to risk thinking and risk practices by critically examining how rationalities and practices of risk impact the wellbeing and outcomes of people who use and deliver welfare services. As a risk researcher, Sonya’s research has focused on a wide range of risk dilemmas that arise in social and health care including in suicide risk assessments. Her co-edited book Beyond the Risk Paradigm in Mental Health Policy and Practice (with Sharland, Heller and Warner) was published by Palgrave in 2017.